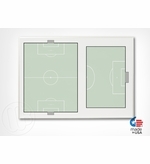 Soccer dry erase boards are an essential tool to help teach, plan strategy or draw up plays. 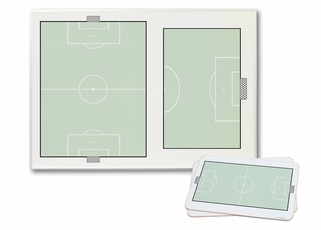 Choose a handheld soccer board for the sidelines or a wall mounted board f for the locker room board or better yet use both to reinforce your lessons. Whichever board you choose it will have beautiful full graphics and a high quality dry erase surface that will write smoothly and erase clean for many seasons. And of course, if you don't see what you need, we can custom print your design or add your logo to one of our designs. Simply call us at 877-393-0111 or create your own custom soccer board. Non-Magnetic soccer boards with the same great writing surface. Wall mounted magnetic dry erase board with full soccer field and close up of the goal zone.